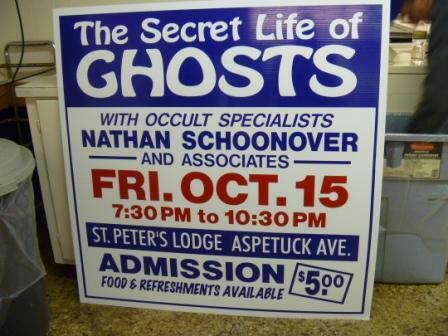 At The Secret Life of Ghosts, Nathan Schoonover (yes, I know most of you know him, but I’m clarifying it anyway) of A&E’s two-night specialExtreme Paranormal hosted several area paranormal investigators who were extremely generous with their time and talents in support of St. Peter’s Masonic Lodge in New Milford–and boy did they attract a sell-out crowd! 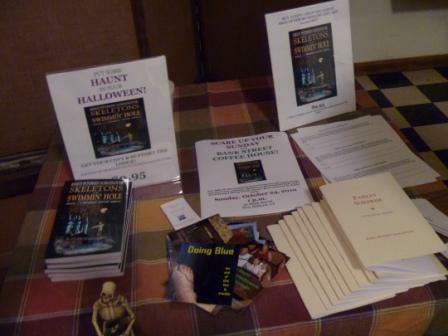 Skeletons in the Swimmin’ Hole was on hand and sold so many books we were able to make a healthy contribution to the Lodge’s fund as well. These signs promoted the event all over town. 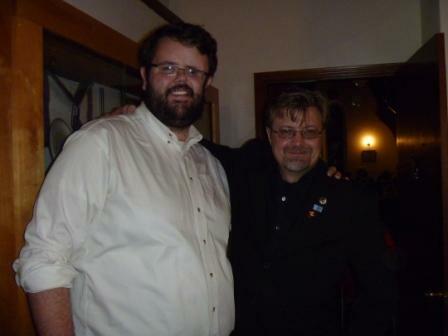 Nathan and one of his Lodge brothers, Kelly. Here’s a shot of the crowd. 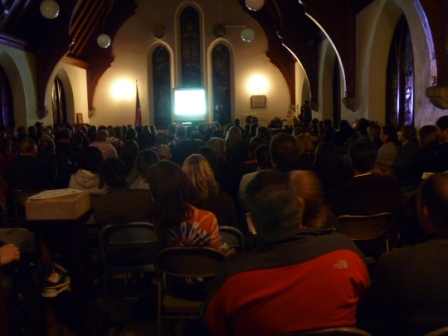 It was SRO! 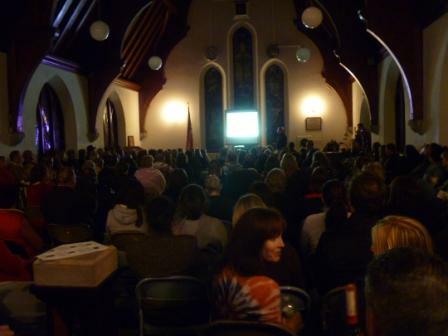 The Lodge’s upstairs was a perfect setting for this event. Andy Seidel of the East Coast S.C.A.R.E. 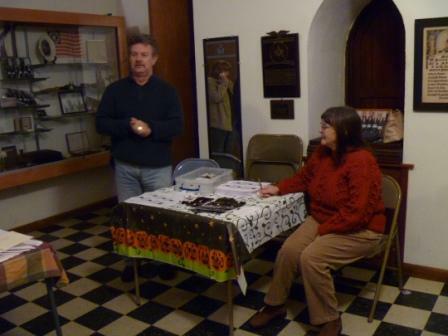 Society, Carrie Kearns and Mike Mafera of Connecticut Paranormal Encounters and Research (CPEAR), freelance investigator Donna Parish-Bischoff, Orlando Ferrante and Joe Franke of the Connecticut Paranormal Research Society, and Nathan educated and entertained the crowd. 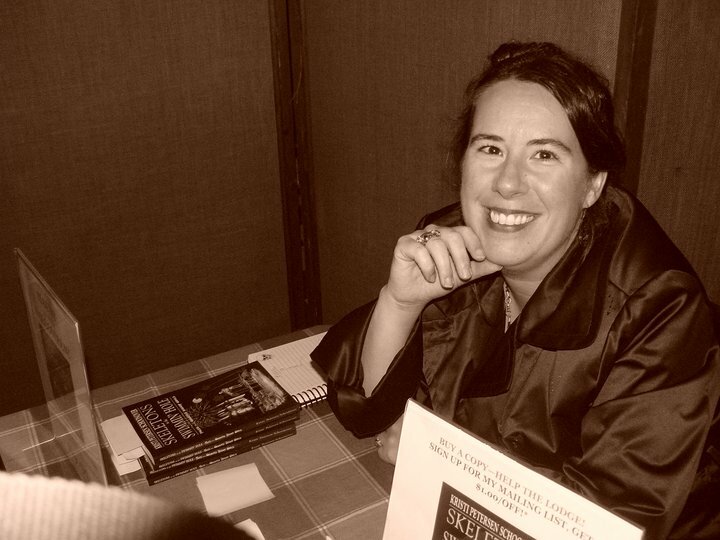 Topics ranged from serious investigations to techniques to the occult–and frightening EVPs, videos, and other evidence. 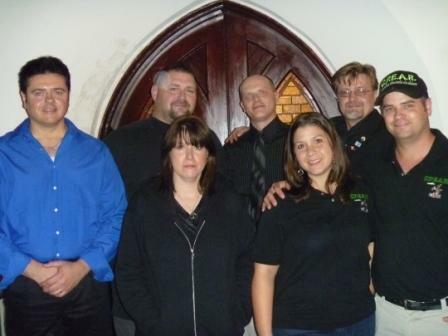 Thanks to these investigators and their generosity, a significant sum of money was raised for the Lodge’s Repair Fund. 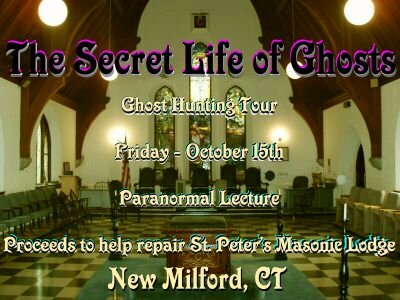 Paranormal Investigators at The Secret Life of Ghosts. Left to right, back row: Orlando Ferrante (in blue), Joe Franke, Andy Seidel, Nathan Schoonover, Mike Mafera. 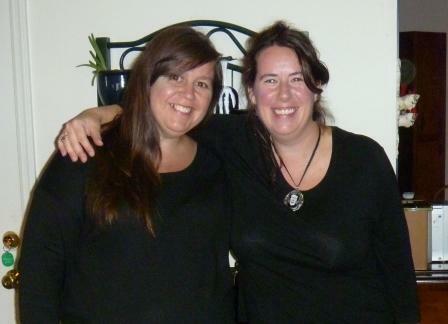 Front row, left to right: Donna Parish-Bischoff and Carrie Kearns. 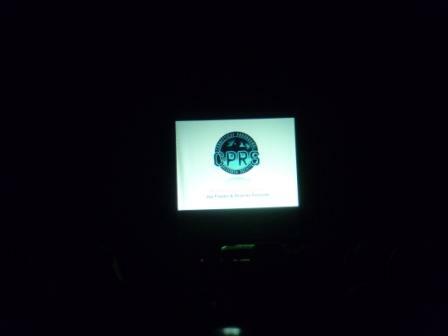 CPRS begins their terrifying presentation. 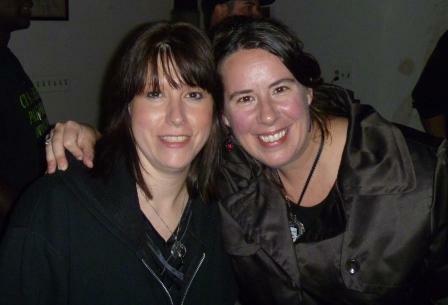 For me, the night closed out with a rare treat — one of my closest childhood friends, Kristina Hals Strobel, was in town! She came to the event, and we went back to my house and literally sat up all night, just like at the sleepovers we used to have. The only thing missing was Kristina’s Mom telling us to stop talking and go to bed every hour! Ha!